Algorithmic Transparency filed this request with the Oklahoma Department of Human Services of Oklahoma. The requested records will be made available to the general public, and this request is not being made for commercial purposes. 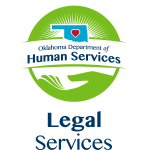 Please see the attached letter in response to your Open Records Act Request to the Oklahoma Department of Human Services. CONFIDENTIALITY NOTE: This email message and all attachments transmitted with it may contain legally privileged and confidential information intended solely for the use of the intended recipient, or the employee or agent responsible to deliver it to the intended recipient. You are hereby notified that any reading, dissemination, disclosure, distribution, copying or other use of this information without the permission of the State of Oklahoma Department of Human Services is strictly prohibited. If you have received this message in error, please notify the sender immediately by telephone at (405) 521-3638; or by electronic mail to judi.abrams@okdhs.org<mailto:judi.abrams@okdhs.org>. I wanted to follow up on the following Freedom of Information request, copied below, and originally submitted on Sept. 16, 2016. Please let me know when I can expect to receive a response, or if further clarification is needed. We are in receipt of your latest correspondence of October 5th at 4:01 a.m. In response to your inquiry, we are working on your request. The agency is ascertaining what materials exist that would be responsive to your request and estimating the time and labor needed to gather the materials and respond to the request. You will be provided an invoice to cover the costs of that time and labor. Please note the invoice must be paid in full before we will be able to gather the responsive materials and make them available for review. Again, we are working as diligently as possible on this request. Additional communication concerning this request was sent via certified mail yesterday, November 3, 2016.